There will always be worry and grief of some type or the other. There is no escaping it, be it in the past or future; while walking, dreaming or even while sleeping. But by placing faith in the Lord and dedicating everyday chores and tasks to Him, the effect of these constant worries can fizzle out completely. Here’s how. 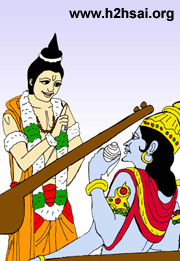 One day Narada boasted before Lord Vishnu about how there wasn’t any devotee better than him. But in doing so he went against the very first qualification of a devotee - freedom from egoism. So, in order to teach Narada a lesson or two in devotion, Vishnu spoke of a farmer, who was tilling his little plot of land, as a greater devotee. He even recommended that Narada should visit and learn the art of devotion from him! A little humiliated but at the same time curious, Narada proceeded to the farmer’s village. But what he saw amazed him. The farmer was all the time engrossed in either doing his work on the field, in the cattle shed or was busy at home. And in spite of the most vigilant watch, Narada did not hear him utter the Lord’s name more than thrice a day; once when he woke up from bed, another time when he took his midday meal and the last when he retired for the night. Narada was naturally incensed that he was deemed inferior to this very poor specimen of a devotee. While Narada was always singing melodiously the divine stories of the Lord and spreading everywhere the message of chanting the name of the Lord, here was a horny-handed son of the soil who remembered the Lord just three times a day, whom Lord Vishnu judged as being superior to him! He hurried to heaven, his face flushed with anger and ignominy, but Vishnu only laughed at his plight. In answer to his anxiety, the Lord gave him a pot full to the brim with water and asked him to carry it on his head and go round a certain course without spilling even a drop. Narada did so, but when asked how often he had remembered the Name of the Lord while doing so, he admitted that in his anxiety to walk without spilling the water, he had forgotten the Name completely. Vishnu then explained to him that the farmer, who was carrying on his head more precious and more spoilable burdens than a pot of water and who had to be careful not bring harm to any of them, must therefore be more admired for remembering the Lord at least three times a day! So, even if you remember the Lord with thankfulness at least thrice or even just twice a day, it is rewarding enough and confers with you with great peace. Do not give up your worldly duties, but do them with the Name of God on your lips, thus inviting the Grace of God upon you.